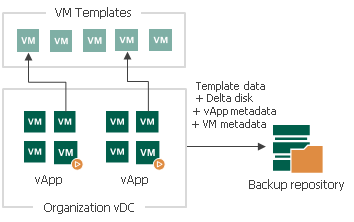 With Veeam Backup & Replication, you can back up regular VMs and linked clone VMs. During full backup of linked clone VMs, Veeam Backup & Replication consolidates data of the VM template and delta disk and saves it as a regular VM disk in the backup file. Data merging guarantees proper VM restore: even if a VM template is lost by the time of recovery, you will still be able to restore the linked clone VM from the backup. During incremental backup, Veeam Backup & Replication saves only changed data of the delta file. Disable CBT (Change Block Tracking) in the backup job settings. Ensure that CBT is enabled on the VM template to which the VM is linked. For details on how to enable CBT on the VM template, contact Veeam Customer Support. Performing backup of linked clone VMs created with services other than vCloud Director may cause snapshot-related problems. To overcome this issue, disable Veeam Snapshot Hunter. For details, see this Veeam KB article.